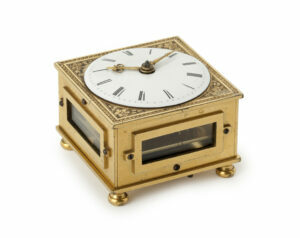 A German gilt-metal striking square table clock with alarm. 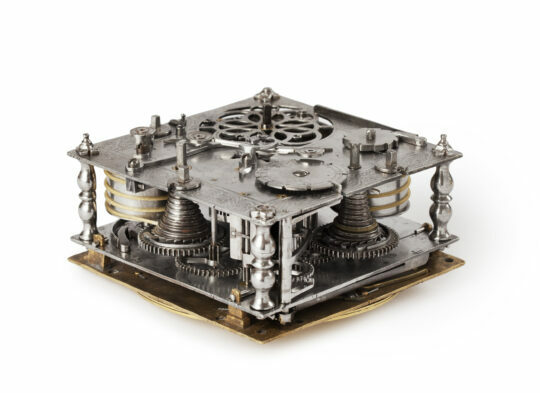 Movement The spring-driven steel movement has four square pillars, the going train has a gut fusee and a verge escapement with a balance, the striking train has a countwheel striking the hours on a bell, while the alarm assembly is housed in the inside of the bell. 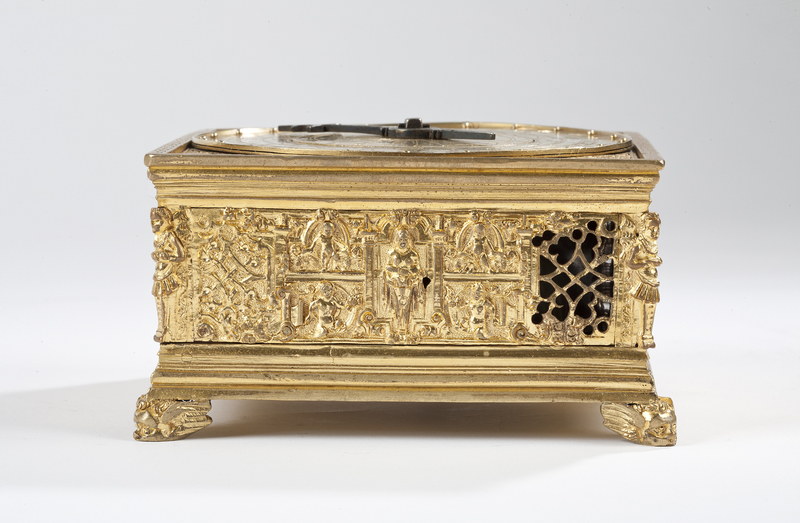 The backplate is covered with a pierced gilt plate and richly engraved with scrolling foliage. 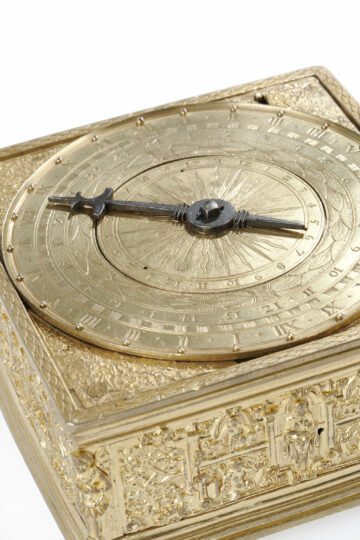 Dial The dial has chased corners, with twice XII outer Roman hour chapter ring with half-hour marks and touch pieces for the dark, and with an inner Arabic 24-hour ring. The centre has an Arabic twice 1 – 12 alarm ring, with a blued steel hand and an alarm pointer. Case The case of this Tischuhr is cast in high relief and depicts a host of figures, each panel is centred by a female herm and flanked by various putti and satyr herms holding a cornucopia in their hands, while each corner is finished with a pilaster in the shape of a male herm. 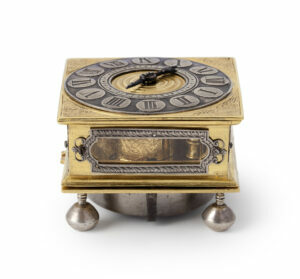 Two corners are pierced to enhance the sound of the bell, while the stepped base rests on four feet and is held by a richly engraved pierced bottom plate. 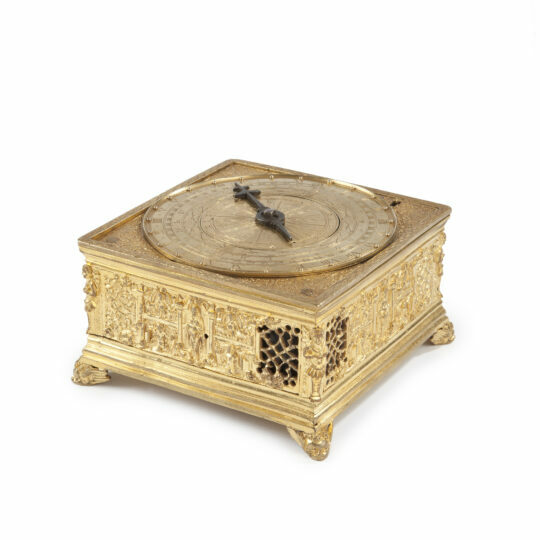 About this clock This type of clock dating circa 1560 is extremely rare, and this work of art is of the highest possible quality, complete with a beautiful case cast in high relief. 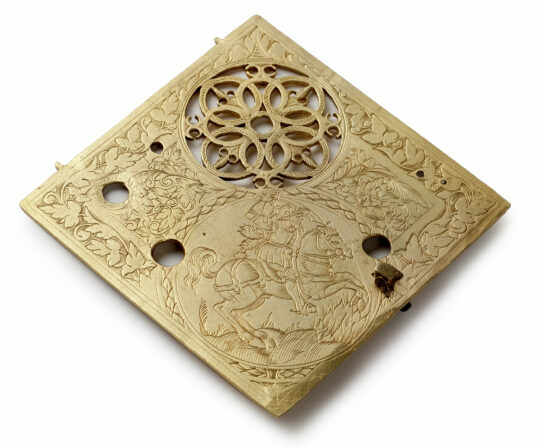 The fact that the case is cast is an interesting element, since most of these clock cases were engraved in the middle of the 16th century. When taking a closer look at the figures on the panels, some similarities can be found in literature. In Ingrid Weber’s book, Deutsche, Niederländische und Franzözische Renaissanceplaketten 1500-1650, comparable figures can be found in illustrations 241 and 249. 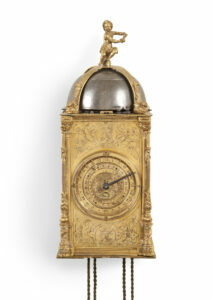 The author refers to the workplace of Wenzel Jamnitzer (1508-1585), the famous son of the goldsmith, Hans Jamnitzer. 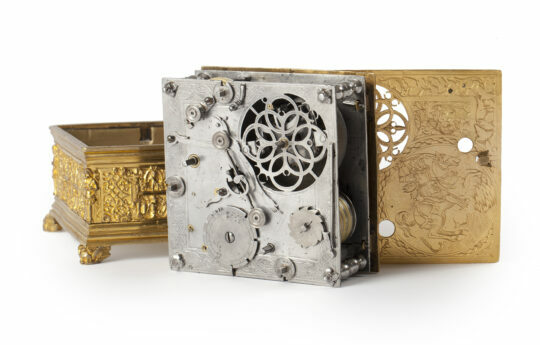 Wenzel combined classical and natural ornamentation such as grass, flowers and other small creatures, which were often casts of actual plants and animals. He received commissions from successive Habsburg rulers and also worked for the leading families of Nuremberg. Lituratur — –Ingrid Weber, Deutsche, Niederländische und Französische Renaissanceplaketten 1500-1650, München 1975., ill. 241 and 249. -MENTINK & ROEST, magnificent clocks from the Mentink & Roest Collection, p. 36-37.